Green factor: Recycling, no composting. Styrofoam containers. What’s one to do when they’ve just donated half a litre of blood? If you’re me, you walk a kilometre up the road in the blazing hot sun to try out chip shack S&G Fries and Burgers. Canadian Blood Services didn’t say not to! I had passed by S&G in some previous travels, and had them in mind while I was in the neighbourhood. After all, I had eaten healthy all day in preparation for my donation, and now needed some hearty food to replenish my depleted body. I thought they were a chip wagon, but they’re actually a small hut, so technically they’re not a food truck, but many of their chip-slinging truck brethren are just as stationary as S&G is, so I’ll let it slide. Are you “Out of control” or “Almost dead”? Their menu is fairly typical for a chip shack/wagon, with fries and poutine, burgers, hot dogs, and chicken fingers. The one deviation is the option for an open-end egg roll from Golden Bowl. I was surprised that they source them from a place way out in the east end of the city, when Golden Palace is just minutes down the road; although maybe they’re too close for GP’s liking. 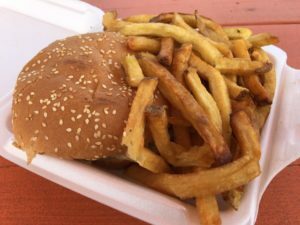 I’m always leery of getting burgers at chip shacks/wagons because too often they’re just a crappy frozen patty. However, S&G has a homemade patty, so I went for their cheeseburger platter ($10.60, taxes in) and tacked on an egg roll, ($2). 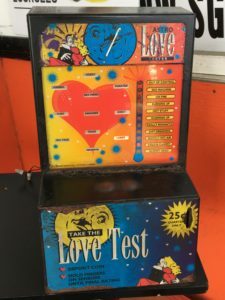 I was amused that they had a small “love tester” machine, which for a mere quarter can tell you where you are on the scale from “out of control” to “almost dead”. I passed on using the machine, lest I learn the terrible truth. My food was together in quick order, and I set up shop on one of their very orange picnic tables to watch the lovely sights of rush hour traffic on Carling. The burger had a large, toasted bun, but unfortunately just a regularly-sized patty (~3oz), so the meat-bun ratio was way off and left me with mouthfuls of what was effectively a tomato and lettuce sandwich. 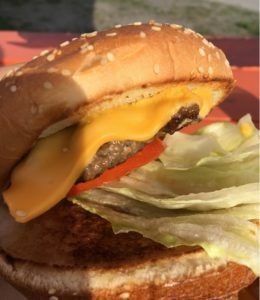 The patty had a nice texture thanks to its freshness; it was good and juicy, and had a bit of char from the flat top, but the excessive amount of bun kept it from really shining. The cheese slice was pleasantly melted, so it had a leg up on most fast food joints. I enjoyed the fries – which were hand-cut and plentiful – as they were nice and crisp. You’ll want to give them a toss of salt before you leave the hut, mind you. 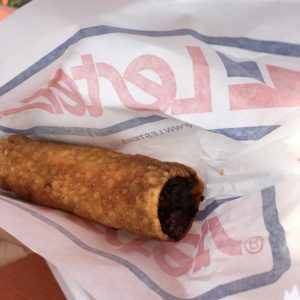 I was amused that the egg roll came in a Lester’s hot dog wrapper – work with what you’ve got, I suppose! It was wonderfully crispy, although I found it a little blander than some other egg rolls I’ve had in Ottawa. 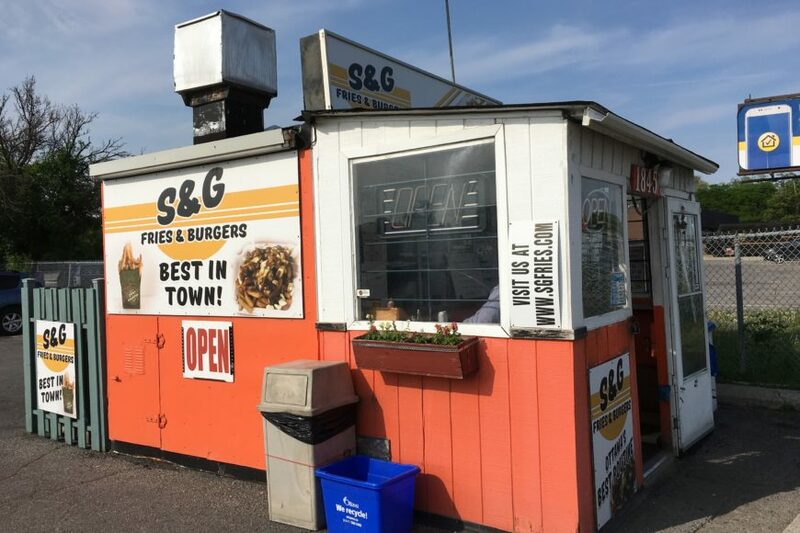 If you need a quick bite on the western part of Carling, or just want to see how your love life is looking, pop by S&G Fries and Burgers – and make sure you bring a quarter.